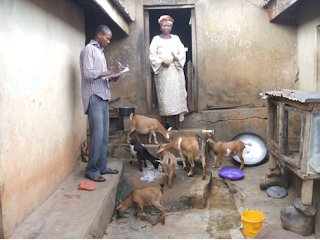 We realised that small ruminants’ husbandry play a very crucial role in the lives of residents of rural Nigeria and this is because small ruminants provide the easiest and readily accessible source of credit available to meeting immediate and urgent social and financial obligations especially among the vulnerable women. Findings from our recent study show that rural women are involved in the rearing of small ruminants - sheep and goats especially around homes by feeding them kitchen wastes or most times leave them to graze on surrounding herbs and shrubs. Primary data collected through administration of structured questionnaire and relevant secondary information gathered from livestock institutions in the study area were analysed using descriptive and inferential statistics. The results of the analysis revealed that 58.7 percent of the respondents had farming as their primary occupation. Analysis of respondents based on the types of livestock raised showed that goat was the most preferred with about 72 percent of respondents indicating it as their favourite and this is unconnected with the fact that consumption and marketability of goat has no religious/ethnic/cultural restrictions. Next to this is poultry (53.5 percent) and the least preferred among the livestock is swine. The result further revealed that 67.7 percent of the respondents utilised part of the income generated from small ruminants’ rearing to meet the welfare needs of their members and settle unforeseen financial demands such as paying hospital bills (10.4 percent) and assisting relations in emergency situations (7.8 percent). However, education and poverty status of respondents were found to be important determinants of revenue realised from small ruminants. Going by our findings, we therefore recommend that efforts should be geared at building capacity of respondents through education since respondents with formal education were better able to monetise their animals and get better returns. Also, sensitization on family planning and improvement on existing infrastructural facilities in the study area are very important in boosting the financial status of the women.